Adam Glanzman/Getty ImagesThe Red Sox’ four-game sweep of the Yankees put the AL East title further away from New York’s grasp. The New York Yankees were swept in a four-game series by the Red Sox in Boston over the weekend. Heading into the series, the Yankees had a chance to close the gap on Boston’s division lead, but instead, they essentially played themselves out of AL East contention. As of now, the Yankees are on pace for a 100-win season that would conclude with the unfortunate reward of a one-game, do-or-die Wild Card spot at the end of the season. Heading into the weekend, there was a sense that the four-game series between the New York Yankees and Boston Red Sox in Boston could provide some of the most compelling regular season matchups in recent memory. The stakes were high for New York – the Yankees were 5.5 games behind the Red Sox in the AL East, and facing the potential of becoming the first team in MLB history to win 100+ games and land in the one-game, do-or-die Wild Card spot in the AL. With a big showing against the Red Sox in Boston, the Yankees could breathe life into the race heading into the homestretch of the season. Instead, the Yankees floundered, losing four straight games to their arch rival in depressing fashion, falling 9.5 games off the pace in the AL East and basically gift-wrapping the division to the Red Sox. The Yankees’ dreams of taking down Boston on the road lasted three innings, with New York jumping out to an early 4-1 lead on Thursday night to start the series. 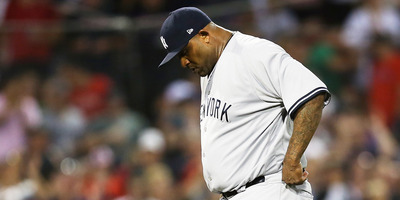 Then, in the bottom of the fourth, the wheels fell off, with the Yankees giving up eight runs in an absolute nightmare of an inning from CC Sabathia and reliever Jonathan Holder. Boston would take down New York 15-7 in that game, and the Yankees would not lead again until the final game of the series. After consecutive losses on Friday and Saturday, New York finally looked like it had a bit of a spark on Sunday, taking a 4-1 lead in the seventh inning. They would hold on to the lead through to the bottom of the ninth, only to watch as Boston cut through the Yankees stellar bullpen to tie the game and later walk-off in the 10th. Despite having the Red Sox down to their final out, an error in the ninth would keep the game alive, giving the Yankees just enough time to find yet another way to lose. Safe to say, the Yankees’ weekend could not have possibly gone worse. Rather than competing for the division, the Yankees will likely now have to keep their wits about them to hold on to their Wild Card spot in the AL. Despite the four straight losses, the Yankees are still 68-42 – a record that puts them 4.5 games ahead of every team in the National League. But instead of cruising to a division win and a spot in the postseason, it looks like the Yankees will have to sweat out a winner-takes-all elimination game at the end of the year just to make the playoffs. Should they win their Wild Card game come October, the Yankees will almost undoubtedly have to face the Red Sox once again in the ALDS. Hopefully for them, that meeting goes a bit better than this past one.